Quilt Sandwich has the largest collection of extra wide fabrics in the UK. Most extra wide fabrics are 108 inches wide and this makes them superb to use as quilt backings as there is no need to join fabric. This also means that they are much better value. All our fabrics are 100% cotton and can also be used for standard patchwork, dressmaking, bags and indeed many other projects. We also have a range of extra wide traditional Indonesian Batiks which we have had specially made for us. Standard width batik is usually made on tight woven fabric called 50s. This is a little too tight for quilt backs and not recommenced. All our batiks are made on 40s fabric which is perfect. So how much extra wide fabric do I need? If you are having your quilt top longarmed, normally at least 4 extra inches are needed around the quilt top, so measure your top in both directions and add on 8 inches. If not then you still need some extra wiggle room. As a quick guide a king size quilt would normally require 3m, a double 2.5m and a single 2m. There are 39 inches in a metre for those who are calculating. This year we have been invited to take our fabrics to a couple of local shows. 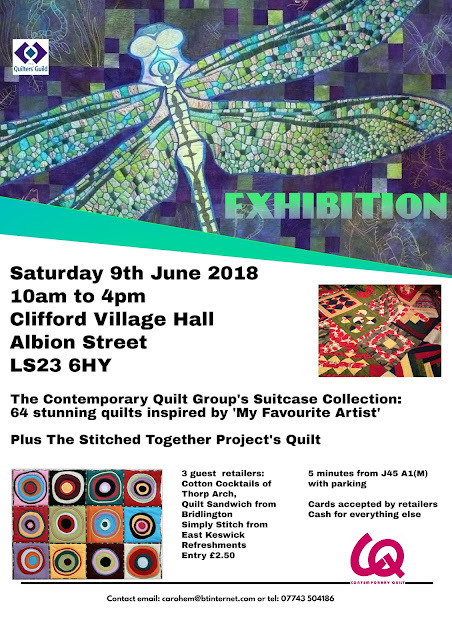 On 9th June 2018 we will be at Clifford Village Hall, LS23 6HY and 13-15th July 2018 at Whitby Quilt Show. We will also be at Festival of Quilts at the NEC 9-12th August 2018. So don't forget your fabric swatches to match up for a beautiful quilt back. If you want tickets - use the code EX18 which will give you a discount.